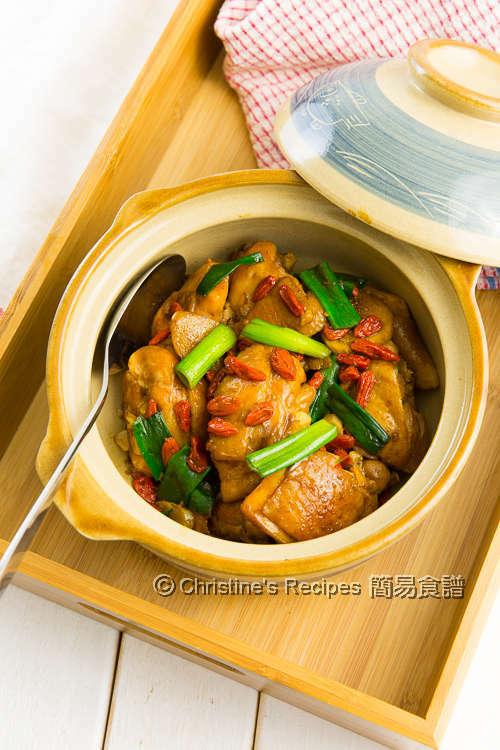 Traditionally, this Shaoxing Goji Chicken is a claypot dish made in winter days. I reckon this dish can be enjoyed on any days throughout the year. It’s so tasty with splendid aroma, perfectly goes with steamed rice. I like the colour contrast of this chicken dish. It’s so appealing to the family’s eyes. Once it’s served on our dining table, everyone was eager to dig in and taste. 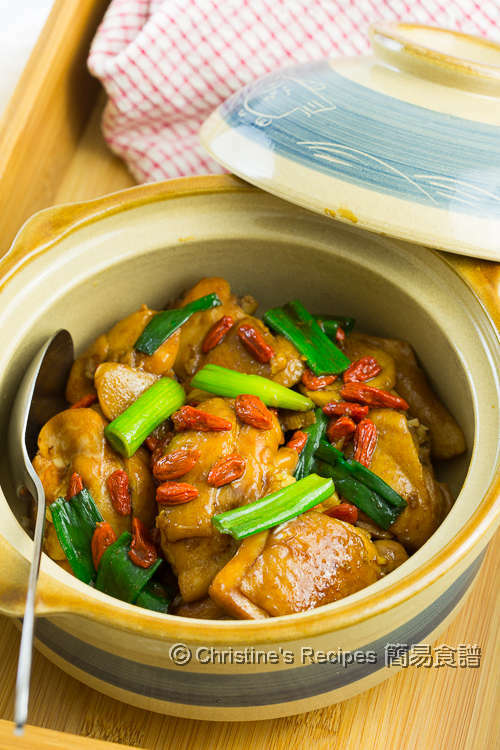 If your family is not too quite into the shaoxing wine aroma, or you have kids or seniors, you might skip the wine part as it won’t comprise the taste of the whole dish at all. Yet, I highly recommend you to follow the traditional cooking way and add the wine because it will make the whole dish smell so good. To make this dish, it’s best to use chicken parts with bones, like chicken legs or chicken thighs with bones. Simply use a very sharp cleaver to chop them into large chunks, so that they are easily cooked through. Beware of the bones if you have young kids though. Marinade the chicken pieces beforehand. 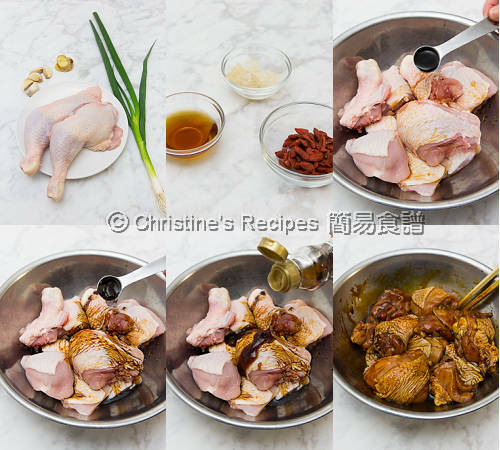 While cooking, the marinated chicken pieces are braised with shaoxing wine in the first stage. The alcohol will be gone because of the heat, leaving a mild sweetness behind. Once the chicken is cooked through, you might like to sprinkle more of shaoxing wine just before serving onto your dining table. When you open the pot lid, the wine aroma will escape and do the trick of attracting your guests’ appetite. That’s the highlight of this shaoxing chicken dish. Personally, I like to top this dish up with some goji berries adding more nutrients and a contrast in colour. You won’t know how tasty the goji berries are before you taste them. They absorb all the goodies in the sauce. Speaking about the sauce, my family didn’t want to miss any bit of it since the sauce taste heavenly delicious. I tried to drain out every single goji berry and didn’t want to miss any one of them. Rinse the chicken legs. Wipe dry with kitchen papers. Cut into 2 to 3 pieces. Mix with marinade well. Set aside for 30 minutes. Rinse goji and soak in water for 5 minutes. Drain well. Set aside. Heat oil in a wok over medium-high heat. Saute garlic and ginger. Add in chicken pieces. Stir fry and cook until the surface colour changes. Pour in water. Add rock sugar. Sprinkle 2 tablespoons of Shaoxing wine (Hua Diao wine). Cover and cook for 15 to 20 minutes, or until the chicken is cooked through and sauce is reduced by half and thickened. Add spring onion, red chilli and goji. Stir to combine. Stir in 1 tablespoon of wine before serving if you like more wine aroma. Serve hot. You can use half of a chicken instead. The chicken will release some water while cooking. So don’t add too much water at the first stage. You might add in some water later if necessary. The power of every stove is not the same. Please adjust the cooking time accordingly. Don’t over cook the Goji. The residual heat in the wok or pot is good enough to cook through the goji. My mouth is watering terribly, Christine. Didn't realize how much I miss real Chinese food until I see this!! Same here. We miss our hometown food so much. Make your own to ease your craving. I know you're an excellent cook. Can I use a pressure cooker to cook this. Thanks. I think you can. But you need to experiment and find the optimal cooking time. This looks wonderful! I do have a question though, do you cook the chicken in a pan or a clay pot? 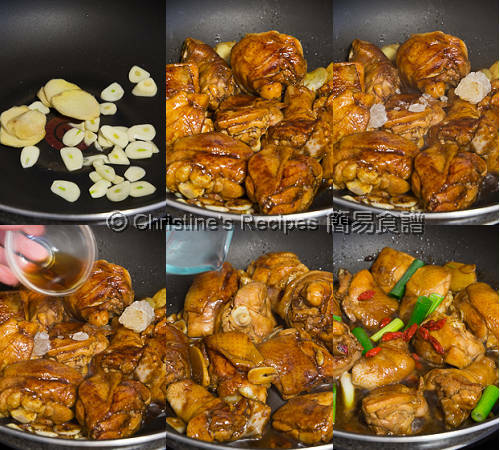 Or do you cook the chicken in the pan and transfer it to the claypot? For creating this recipe post, I need to shoot some photos during cooking. It's much easier to manage when I used a pan to cook. If using a claypot, I need to take special care and make sure not to let the ingredients burnt at the pot bottom. 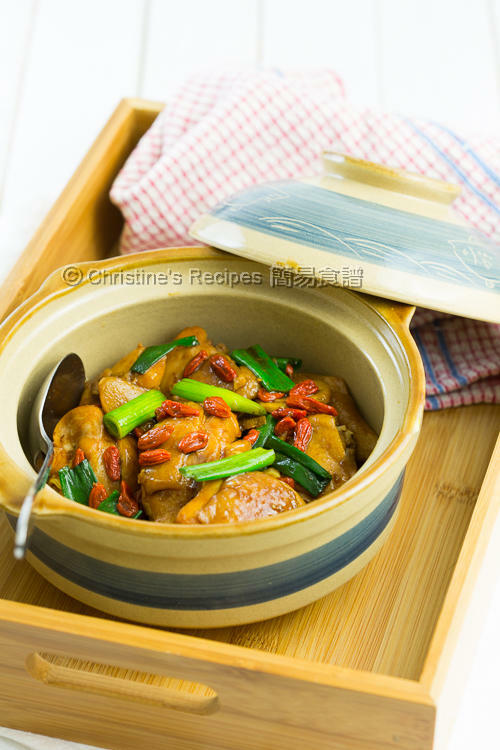 So, if you don't have a claypot, you still can make this dish. The taste is equally the same. Dear Christine, I love your recipes they r so simple to follow and yet delicious. Made this tonight but I added mok yee turned out great! Can you please advise instructions for cooking in a clay pot? Thanks. It's quite similar to cook in a wok, but you have to handle with care. Follow the instructions in this recipe. In step 2, pour in boiling water instead, to cook the chicken. Otherwise your clay pot might crack if you pour in cold water. Is 1/4 cup water (60ml) too little to simmer the ingredients? I am afraid the chicken & ingredients may burn. Do u add in the marinade as well? The amount of this recipe has worked in my kitchen. Feel free to adjust the amount of the water to suit your case as the power of your stove and utensils you used will be quite different from mine.